The chief prosecutor of the International Criminal Court says he will open a preliminary examination into allegations that North Korea committed war crimes on South Korean territory when it sank a South Korean warship in March and shelled a southern island last month. 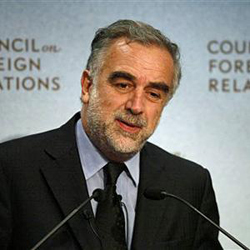 ICC Chief Prosecutor Luis Moreno-Ocampo's office announced he would open what is known as a preliminary examination, the first step to a possible formal investigation, into whether allegations that Pyongyang sank the South Korean warship Cheonan and shelled the island of Yeonpyeong constitute war crimes under international law. Both incidents resulted in the loss of lives. Prosecutor Moreno-Ocampo told reporters at the United Nations, where he is attending a meeting on States Parties to the court, that his office had received communications about the incidents from "citizens in different parts of the world." He said South Korea, which is a State Party to the court, did not ask for the preliminary review. Moreno-Ocampo made clear that what he is doing is not an investigation, but the first step to determine whether a formal investigation is warranted. "I am not saying I will do open investigation, I am reviewing if I have to open an investigation," said Moreno-Ocampo. "It is not an investigation. Before starting an investigation the prosecutor of the International Criminal Court has to define if the crimes are under the jurisdiction of the court. And that is what I am doing. So I am trying to understand if these are war crimes in the territory of Republic of Korea and if there are no national proceedings." International Justice Program Director at Human Rights Watch Richard Dicker says the ICC prosecutor is sending a message to other states that just because they are not States Parties to the court does not mean they can escape justice. "I think what is significant here is for North Korea and for others to understand that they are not beyond the reach of international justice through this court simply because they remain outside as non-States Parties," said Dicker. There was international condemnation of the sinking of the Cheonan last March. North Korea rejected an international investigation that found that a torpedo fired from one of its ships sank the vessel, killing 46 South Korean sailors. Tensions have risen again on the Korean peninsula, after Pyongyang shelled Yeonpyeong Island last month killing two South Korean marines and two civilians. Seoul has said it will retaliate if Pyongyang strikes again.